Hot shot croupiers are the heart of the Ace business. Our casino staff are second to none, highly trained, seasoned, fun, intelligent and entertaining as well as experts in their craft. Our croupiers not only know the games, they know the rules and can guide anyone to play. They may even throw in a few pointers for free! Our staff always arrives suited for the part, but we can offer special outfits for extra special events. We have newly released our silver and gold sequin vest and bowtie combination for that extra Vegas touch. 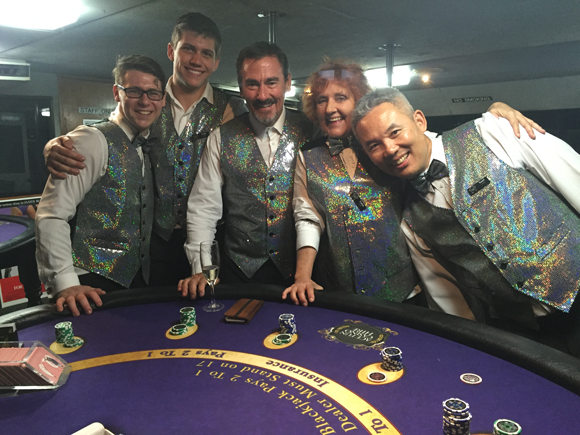 Upon request our croupier will arrive for your event shining like the magnificent dealers they are. We are always looking for new croupiers to join the Ace family. If you think you have what it takes and want to try our elite croupier program, send us your resume and take the first step to being an Ace Hot Shot Croupier.